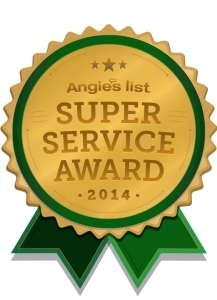 KNOXVILLE, TN – 1st Choice Home Inspections has earned the service industry’s coveted 2014 Angie’s List Super Service Award, reflecting an exemplary year of service provided to members of the local services marketplace and consumer review site in 2014. For two consecutive years, 1st Choice Home Inspections has qualified for this award, owing it to their clients who have consistently praised them in the review process. Angie’s List helps facilitate happy transactions between nearly 3 million consumers nationwide and its collection of highly rated service providers in 720 categories of service, ranging from home improvement to health care. Built on a foundation of authentic reviews of local service, Angie’s List connects consumers directly to its online marketplace of services from member-reviewed providers, and offers unique tools and support designed to improve the local service experience for both consumers and service professionals.